We might not realise it but in our modern world we’re swimming in virtual sea of toxins. Toothpaste, cooking utensils, in our home and in our car; potentially harmful chemicals are almost impossible to escape. But, if you know where these molecular nasties are hiding there are things you can do to reduce your exposure and your chances of suffering in the future. 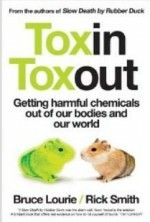 In this Nightlife podcast Tony is entering the secretive world of toxins with authors of ‘Toxin Toxout’ Bruce Lourie and Rick Smith. TAKING OUT THE TOXINS PODCAST.